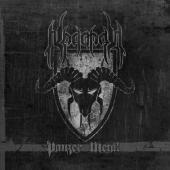 Hamburger band NEGATOR returns after five silent years with their third album “Panzer Metal”. They point out that black metal is dead and reclaims the nineties with only slight camouflage of the 21 century. They have enlisted the aid of producer Eike Freese (DARK AGE, CALLEJON) and compare their output to the finer moments of BELPHEGOR and BEHEMOTH. Opener “Dignity of War” bare sound 2010 at all. The main focus is divided betwixt war and hysterical drums. German bands often favor doing lyrics in their mother tongue, and NEGATOR contribute with “Alte Werte” and “Feuerstorm”. “Alte Werte” has an unusually sing-along refrain – but apart from that it is relentless black metal. I wonder what the 2010 parts are; I hear mostly echoes of at least ten year old outputs. The guitars are so typical of the genre, and that goes for the drums too. A Norwegian inclined voice ranges from screeching to high pitched. The growl is however clear in a strange way and the melodic guitar parts seem to increase from track five onwards. From “scent of Styrax” the album seems to change to the better. The songs that impress me most are the aforementioned “Scent of Styrax”, the title track and the quite melodic closer “Illness Mankind”. The grooves and slower parts of old-fashioned death metal create an atmosphere plus give drummer Samebrann a well-earned “break”. NEGATOR certainly can play fast, almost in the league of BEHEMOTH. But a tad more melody will not take the edge out of their brutal onslaught. The thing is to be a cut above the rest in the brutal genre today. NEGATOR are getting there, and will surely spread their message.